Please visit my new website to view showreels. Another great bunch of guys I worked with. I had great fun overall and I am going to miss working with them. 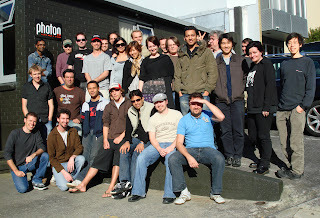 But I am pretty sure I am gonna work with some of them again in the future as the industry down under is quite small. Like the other crew photo, two of the guys were not there, so we comped them in. Working right next to Weta Workshop was quite cool as I had the chance to see all the physical props from the movies and unlike other exhibitions I was actually allowed to touch them and play with them too. Well a lot of friends have asked me what settings I have used to get such a good quality compression while keeping the file size relatively small. My reel is about a minute long and the size is around 7.5 MB. 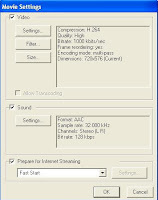 You can get the similar file size if you use DIVX, but we all know that is not very useful if want to go frame by frame. Anyways, for this to work, you must have Quicktime Pro. It's a relatively small investment. The price is about $30 or so, but it is worth the money. Or you can always ask a friend who has a QT Pro to do it for you. 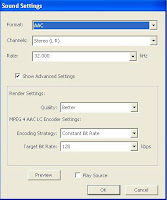 Before you begin, make you sure you export out a uncompressed avi file with uncompressed sound. Now in the save as option, choose "Movie to Quicktime Movie" option from the Pulldown menu next to the "Export" label. That's about it. Just save your file and check out the nice file size now. It should be much smaller than you normally have and with a decent quality. Yeah, here is a team photo. One of the guys left, so we had a some special things planned for him that day. Incidentally, he came late for the group photo, so one of the guys Photoshopped him in. I am quite fortunate to work with a excellent and friendly team.